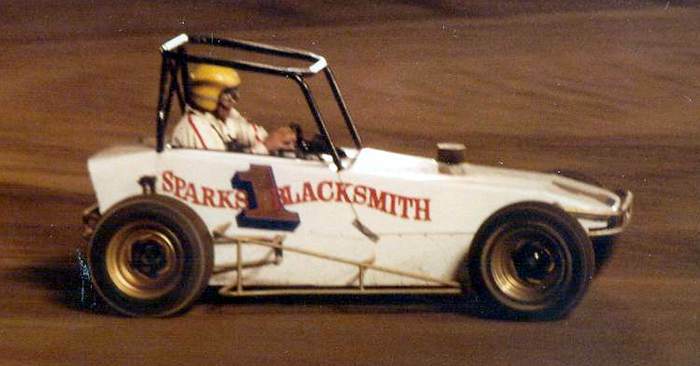 The great Midget & Sprint car driver Randy Roberts started his illustrious career in the Mini Stocks driving a Silver Cortina #48, which was a tribute to his father in law Sam Sauer and here it is, this car went on to become Nick Losasso's first racecar #21. Last edited by rapid30; 05-21-2012 at 05:46 PM. This is Darrell Stingerie's Bug from Lakeside, mid 70's. In the late 70s and early 80s, in Reno Nevada they raced mini stocks and started a division called mini modifieds. Four cylinder Datsuns and Toyotas with a 1200 cc limit. Most used Weber carbs; side draft. You had to use a VW front end and have a 75" wheel base. Some looked like midgets and others like super modifieds. I built one and they were a blast to race there at the fairgrounds in Reno. I wish I had keep pictures as I can't find any pictures today of this division. FASCAR was the organization at the time. There was around 30 cars built. Very affordable racing at the time. From a 1976 Lakeside program. (J.L. McGuire collection) Bill Felton wheels his '57 Volvo around the Lakeside oval in 1974. Ben Weber's #1/2 (Fast) Bug. That's Ben on the right sippin' a cup of Pepsi. (J.L. McGuire collection) 1976 Colorado Mini Stock Association champion Wiley Timbrook. (J.L. McGuire collection) John Inman #23 and Don Hagen #42 during 1975 Lakeside action. (Photo by Jerry Lee McGuire) Frank Young and his lil' blue Omni at Second Creek in 1996. My nephew Scott began his racing career driving Frank Young's Omni at Second Creek. here are some of the ministocks from the reno fairgrounds. also shows some racing from t-car speedway in carson. That's cool, brings back memories. I raced supermodifieds at T-Car in the mid 70s and those mini modifieds at the Reno Fairgrounds in 80. Thanks for posting that. i was at the fairgrounds every wednesday night as a kid.